All topics pertaining to health and diseases that may affect your Tamaskan Dog, as well as treatment. This combination is now listed twice (the Crypto was already listed but now Sawyer also suffers from Epilepsy. Can you please edit your post above to clarify the registered name of Sawyer with epilepsy so there is no confusion as to which Sawyer has epilepsy. It is not Tarheel Wild at Heart (Sawyer). I certainly know which "Sawyer" is being referred to, but others may not know which Sawyer, as I now have a Sawyer too. I think we all should make a conscious effort to use registered names, along with call names if desired to avoid such confusion. My response was not directed at you, but to the general public who did not know, sorry for the confusion. I do agree when it comes to discussions like this, that registered names should be used. CheyenneSunset wrote: Hi I own Harwarden Cheyenne who's parents were Kwakiuth and blustag star dust both at Alba and his hips have gone... Happened overnight ... One night he raced me upstairs I his usual "puppy" fashion and next day could hardly move... It's got so bad he won't even jump up to bark at the postman -his usual daily treat!!! Is this a known issue from this parent pairing? What do you mean with his hips are gone? He can't use them anymore? And it happened overnight? Doesn't sound like any hip issues I'm familiar with. Did you take him to the vet to get a diagnoses? He is at the vet later today I will update... He struggles to raise from lying down, is unable to run, although he tries and will not stay standing for any length of time... When he goes to lay down he just drops down rather than how he did previously ...and yes huge change in him literally overnight... He has always raced the stairs to get to door first so other night was no different to normal however I had to help him up Wednesday am to go outside to toilet and still do sometimes although other times he does get himself up but its a struggle... As I say Chey is at vet today so will update. And didn't Freyja (x Dylan/Zephyr) + Kana (x Jaeger) also produce several Crypto male puppies??? Not up to speed on US litters. Katlin wrote: I think the White Elk litter also had a crypt...I'm not 100% on that though. I also thought they had one or two pups, someone would have to ask Ben and Kira to know for sure though. If so it would be news to me about the Explorer litter. The only cryptorchid Darwin produced is Wylie, to my knowledge. And yes, Freyja has produced three cryptorchid puppies: two from the first litter (Yellowstone) and one from the second (Pi Litter). All of which flew in an airplane at 8 weeks. Which is probably a coincidence but I still have to throw that out there…other male pups are fine. The odd thing is that the pups from the first litter where thus: one male had two descended testicles when he left here, and they were certified by a vet. One testicle went back up and never came back down. The second pup had one retained testicle and one descended testicle at the time he left here (also certified by a vet). The new owners were well aware of the puppy's condition and were fine with it because they just wanted a family dog--not a breeding dog. The odd thing is that the puppy flew and that descended testicle went back up and never came back down. Ugh! The pup from the Pi Litter with retained testicles also went to a pet home so also not a huge concern. Still upsetting, but at least he wasn't intended for a breeding home. Luckily, the only boy in the Snow Litter already has two descended testicles. Hooray! The great thing about Arrow (besides no epilepsy or Addisons) is NO cryptorchidism in his lines, period. Yay! I asked Ben on March 5th 2014 if any of the Explorer litter were cryptorchids and he said one of them definitely is a crypt which means Darwin must be a carrier. Vet didn't use any medical term... He put x ray up and to let me look at it .. It looks like the bones on the bottom of 2 vertebrate have almost fussed together... Said it was inoperable and has to be managed using metacam ... It apparently won't get worse but will cause him pain, stiffness and un comfort from time to time ... However its a huge relief that vet does not think his standard of life will be so bad that I have to consider the unthinkable ... Just need to not let him over exercise or let him think he is still a puppy as he will suffer the following day. Hope you will be able to manage his pain & symptoms with medication, so he can still enjoy life as much as possible! Katlin wrote: I asked Ben on March 5th 2014 if any of the Explorer litter were cryptorchids and he said one of them definitely is a crypt which means Darwin must be a carrier. I agree Tracey, I would like to see pups go home at 10 weeks (if there is only one or no testicles descended) rather than 8 since these pups seem to be such late bloomers. Wylie's first one didn't drop until he was 6 months old. 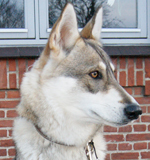 If the 4 tested is Sølve (failed), Kira, Cheyenne and Leska, then this should maybe be changed to Heidi at Blustag (Heidi) x Ohanzee of Torriarno (Rann) as all four have tested out as Rann offspring. 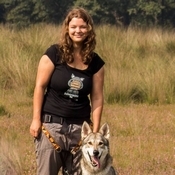 Bow in Norway have been tested with FCIA hips too, although it is yet to confirm whether she is Rann or Jackal offspring. Should we be listing the dogs that have come back with documented stomach issues (IBS) that are now on vegetarian diets? AZDehlin wrote: Should we be listing the dogs that have come back with documented stomach issues (IBS) that are now on vegetarian diets? I would like to see that info added to the list. Is IBS genetic or unknown cause at this time? Yes, I think so. A Tamaskan that is allergic to protein and can no longer eat meat (vegetarian diet only) IS a very serious issue... we also have a few cases within the breed of Tams that are allergic to all kinds of wheat / grain, etc (causing extreme diarrhea). It would definitely be good to keep track of the combinations that have produced these dogs so we can see if a pattern starts to develop (if it might be genetic) and so we can also be aware that similar genetic combinations might produce similarly affected dogs. Disclaimer: I support disclosure of any serious medical conditions, especially when breeding. HOWEVER, I'm getting concerned with what I see as a growing problem with managing the breed. There's an old adage from the Soviet Navy known as Groshkov's Rule: [roughly translated] "The perfect is the enemy of the implemented." I think we're at risk of trying to produce "perfect" dogs by means of producing NO dogs at all. When the "screening" becomes so rigorous as to disqualify all dogs from breeding for fear of what MIGHT happen, we are at a net loss. . I do realize that's an exaggeration and a caricature, but not so far that it's unrecognizable. Any disclosure also needs perspective - what are the real odds? What's the typical impact? etc. For example, many Arctic dogs are notoriously grain intolerant - hardly surprising, given their evolutionary conditions. Various estimates of canine populations show as many as ten (10) percent of all dogs showing some food allergy or sensitivity. While they evolved feeding on human scraps, that doesn't mean we have identical biology. Canids simply aren't the same omnivores we are, and we need to respect differences between species. As we learn more, our list will change - that's science. Fact: Given enough humans, we can find similar results from broadly based samples, perhaps at even higher rates. It's only common sense to limit their intake and watch for problems. Yes, we have a duty to encourage the production of healthy dogs. But biology is not mechanics, it's closer to quantum mechanics, with all the statistical uncertainty thrown in. We need to be honest with ourselves about that. We need to understand the "false positive paradox"
When the population size is small, it makes it even harder to figure out what's noise and what isn't. Let's say (for the sake of argument) that the incidence of a problematic medical condition (a specific one) is 1 in a hundred dogs for any given undesirable. Also say that I have a test for that condition that is 90 percent accurate. That is, it will correctly detect the condition .9 of the time. (Which is better than the accuracy of many medical tests). For any given dog tested the odds of a "false positive" given this population size and test accuracy are approximately 10:1 in favor of a false report. That is, 10 dogs will be incorrectly identified as "sick" when they're actually healthy. (The exact number of false results is a little higher, as we have to account for sick dogs not identified as sick, and sick dogs identified as healthy as well). You get the idea, I hope. Disclosure is good, but let us please remember not to scare ourselves into extinction. In no way do I mean to be disrespectful, but in today's world there really is a certitude attached to "science" that good science never claimed, and should never claim. Science that purports to be universal and settled is belief, not science. Our success at some things often makes it harder to see the flaws. To take a trivial example, anyone who's been on a jury knows that it's never quite so easy as the various crime lab TV shows would have us believe. "Evidence" is always incomplete, "Certainty" should always be provisonal. 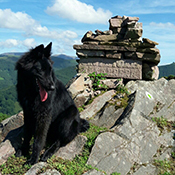 I am not a canine biologist - I don't play one on TV, either But I will contribute what I can to this breed, and that's an understanding of the maths. Please take this in that spirit. I wasn't suggesting that we exclude from breeding any dogs that are intolerant of grain (or their parents) but, rather, that we simply make a note of the individual dogs and the litter combinations to keep track of it... especially if it seems that some bloodlines are more at risk of developing IBS (bearing in mind that the individual adult dogs that were recently diagnosed with severe protein allergies and can no longer eat any meat whatsoever, started out with just a simple "grain intolerance" when they were young). Personally, I feel that the more health issues that are reported, the better... otherwise how else can we develop a better understanding of the potential health problems within the breed? For far too long we were told "the Tamaskan is totally healthy and has NO health issues whatsoever" and any sick dogs were simply swept under the rug by breeders who were trying to hush things up... it wasn't until owners started talking and sharing experiences that it was discovered that, in reality, some of those health problems are actually relatively common within the breed. While grain intolerance is a mild inconvenience, full-blown protein allergy is much more serious - however, it can still be controlled by diet. It is worrying to think that there are some other significantly more serious health problems that may be going unreported... full disclosure must be paramount, not to "scare ourselves into extinction" but simply to be aware. By strictly narrowing down the genepool until only a few "healthy" dogs remain, it actually does far more harm than good because it limits genetic variety while increasing the incidence of inbreeding, which in turn increases the risk of new recessive disorders... moreover, those seemingly "healthy" dogs (which may be DNA clear for all tested issues) may then later go on to develop a severe genetic condition for which there is not yet a DNA test. It is far better to increase genetic variety by selectively breeding based on informed decisions, which is only possible via full disclosure of all relevant health issues. THANK YOU. And we are in complete agreement. What I would have regretted is for people without your background and that of the other registered breeders to make a negative conclusion about the breed based on woefully incomplete statistics. For example, we have enough data to suggest that cryptorchidism is a real statistical risk, albeit at low levels, and (within any confidence level with current data) no worse than other breeds as a whole, and no worse than Shepherds and Boxers. "Three is a run, five is a trend, it takes eight to make a statistic" IUntil we can get enough data to make sure our upper and lower control limits aren't hopelessly fuzzy, disclosure is key, but providing strong context will be required for all involved. firleymj wrote: For example, we have enough data to suggest that cryptorchidism is a real statistical risk, albeit at low levels, and (within any confidence level with current data) no worse than other breeds as a whole, and no worse than Shepherds and Boxers. Yes, I absolutely agree. Also, cryptorchidism is relatively manageable because once the main carriers were identified, it is easy to use that information to reduce the incidences in future generations. Through careful selective breeding, it should be possible to eventually 'breed out' cryptorchidism all together but without losing any valuable genetic contributions along the way (through outcrossing and breeding potential carriers to non-affected bloodlines, etc). Is this list still being updated? 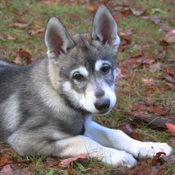 If so, it'd be nice resource for breeders (current and potential) as well as future breeders looking to purchase a Tamaskan (like me. ) to reference. I noticed cataracts and epilepsy isn't listed for 2 Heidi/Bodie (Blustag Sanuye) pups. I am not sure if vom Willebrand's *carriers* need to be addressed? I know we have 2 from Freyja/Arrow litter...possibly more from Sophie/Arrow or Raven/Arrow as they have yet to be tested (too young). I'm not aware of cataracts in the Heidi x Bodie litter?? Wolfsbane wrote: I'm not aware of cataracts in the Heidi x Bodie litter?? 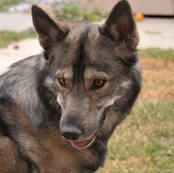 Regarding the epilepsy in a Heidi/Bodie litter, I think it was Blustag Golden Moon at Asgard (Loki) who had epilepsy. Sadly he passed. Ohh I see. But did Tika get a 2nd opinion? I was aware of Loki , the epilepsy has been listed. Wolfsbane wrote: The original topic was created by me on my old account so I cannot update it anymore. A mod would have to do it or a new topic would need to be created. EssiK wrote: I dont know is there this kind of topic allready. 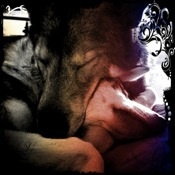 They all are part of my own (And many of other) wolfdogs pedigree(s) and thats why I'd like to know about your problems. According to my understanding, these names can also be found from many of tamaskan dogs pedigrees. There have been some addison and epilepsy on those lines. And there have been also epilepsy on Hero and Whitefang lined dogs. Whitefang x Sara (Hero x Elsa) - 1 dog, this dog got a small electric shock from cows electricfence few hours before shes death. Fidel (Whitefang x Sara (Hero x Elsa) ) x Indy (Sepe (Hero x Dana) x Mimmi (Sepe (Hero x Dana) x Kaisu) - 1 dog from older litter, younger litter is healthy. Indy was allready pregnent when epilepsy in younger litter came to light. In Whitefang line has also had behavioral problems, but I dont know very much about them. So I dont want to say things which I'm not sure. These are all health problems what I know from these lines. 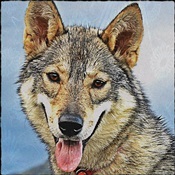 So it would be nice to hear more, this would be also very important information to me and other wolfdog owners and breeders. Thank you allready and try to understand my writings. I'm adding markers to the online database but can't remember some of the dogs (their names) that were affected by Cryptorchidism. * Bindi x Jackal, 1 male? * Heidi x Rann, 1 male? * Frigga x Odin, 1 male? * Vega x Sampo, 2 males? * Vala x Xantho, 1 male? The others I can't remember off the top of my head but the info should be here on the forum somewhere. Thanks for the help. I did do forum searches but couldn't find it, although I don't have access to all parts (breeders section) of the forum so perhaps it is listed there. I've updated the list, let me know if I'm missing anything. Unfortunately there have been 2 more cases (same litter) of the heart condition Subvalvular Aortic Stenosis. There has also been another case of Luxating Patellas. Just want to say that this is an impressive work which is shown in this topic. Congrats to all of you who are doing your best to keeping tracks of every disease for every dogs of every litters. Amazing seriousness, awesome work ! I found the information contained here to be very interesting. Thanks to all who did the research and consolidated the information so neatly into one place! 1) Is it the information in the original post that is being updated as new information comes up? Or is it being updated somewhere else? 2) In the listing of affected dogs in specific pairings, is each occurrence, even of different conditions, an individual dog? Or is it the case that some dogs are affected by multiple conditions but they are listed separately? (For example: if dog “A” has IBS and failing hips, would that individual be listed twice (once for each condition)? Or should I assume that each occurrence of each condition is a separate individual (i.e., none of the affected dogs are affected with multiple conditions)? Yes the original post is being updated. A dog that is affected by two conditions would be listed twice. We are just listing conditions, and the amount of times it occured, within a specific breeding combination. Blustag Lightning Strike (Leo), from the 2nd Susi x Jackal litter, sadly passed away this month at only 6,5 years of age. He had been having seizures at roughly monthly intervals for 3,5 years. Have there been any updates since about a year ago? Thanks!